Set on the foothills of Maharashtra in Alibaug, far away from the busy city life of Mumbai, this property was transformed from a dry barren piece of parched earth to a luxury residence where shadows play an integral part of the design philosophy of the structure. This house is carefully sited between the two trees, grazing its walls into its crown; its three bedrooms, and living spaces surround an half bounded courtyard with a sliver that opens into a small plunge pool; indigo blue water, that spouts out gushing waters. The courtyard is marked with a the babul tree for shade, which as it would grow would engulf its entire space and suffuse the house with its blazing fragrance and a confetti of tiny white flowers every morning. Architecturally the courtyard doesn't open to spaces, but instead, to a broad corridor that works like a woody bridge holding a study, under a sweeping corten steel roof and ties all the upper rooms into a single floor. But the sun is unforgiving; its screeching light needed to be quietened with shade and shadows. From here, emerged the language of its tectonics, both for its architecture and landscape. 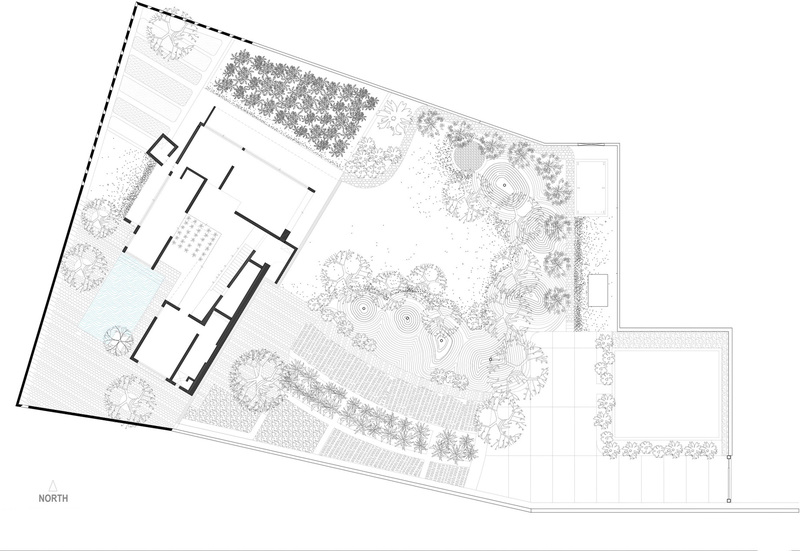 Every element of the residence is designed and detailed as if to obstruct light and shred shadows.